Summer has well and truly come to an end and as September is the month of Self Improvement, we thought we would inspire some change to find your perfect hair look. This time of year has so many gorgeous autumnal hues and if you’ve never tried being a red head now’s your chance. Lena Dunham has made the switch and by all accounts found her fire. We think our Rich Berry hue would achieve this look. You can find more of our stunning reds on our colour chart and if you’re not so daring, then our Rich Rose might be your ideal hair crush. If you’re not too sure about a full block colour, then you can always blend them – ask your Gold Class extensionist for their expert advice to suit your colouring. With your colour sorted, we need to turn to styling. Cast your mind back to LFW AW17 best hair looks and this image was everywhere from Temperley London. So simple to recreate with your ribbon colour of choice, there’s no excuse not to try it. 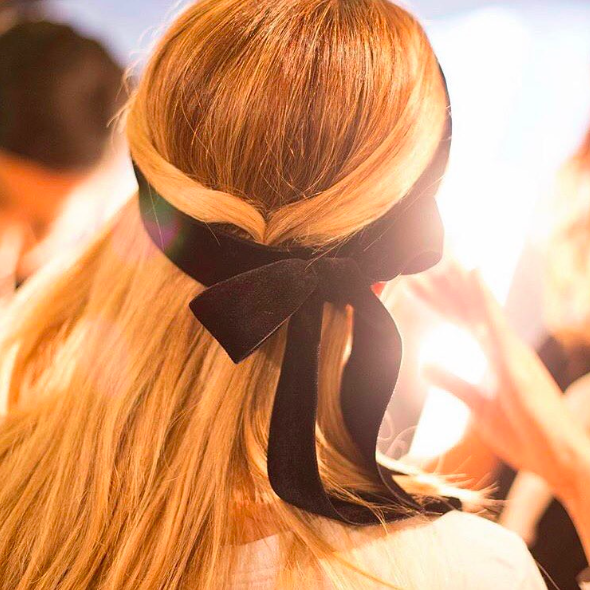 We like this added detail of tying the sides of the hair back into a loose half-up ponytail to help give the ribbon something extra to hold to. Avoid smooth ribbons and secure with a few discreetly placed pins. Need more inspiration? Browse The Telegraph Fashion 41 of the Best Hair Looks for AW17 here. We will keep harping on about healthy hair looks and this really starts with good hair care. Treat yourself to our new look aftercare range and our Conditioning Boost to really add extra nutrients to your locks and add shine. With the changeable weather, we really recommend having some supplies in your handbag too like our brush and Argan Oil to add to the ends of your hair and fight the frizz. More tips on healthy hair can be found in our previous blog or get in touch with your nearest Gold Class salon to organize a hair health check.